My second Arts Society event of the day was a trip to Tunbridge Wells, where I was met by the lovely Joanna Lowe, who greeted me with a warm smile that instantly took my mind off my difficult journey. She also presented me with a bag full of food and drink goodies, which I finally finished off when I was back home at 11pm! What a friendly lot they are at The Arts Society Pantiles! 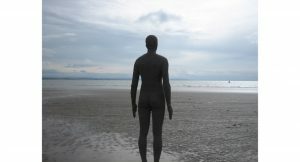 I had a great response to my talk about Antony Gormley, with a good deal of enthusiasm for his work, plus stories of visits to his various art works, particularly The Angel of the North and Another Place at Crosby Beach, Merseyside. I also heard stories of friends and family who had taken part in Gormley’s One and Other, his Fourth Plinth intervention in 2009, when 2,400 lucky people were allocated an hour’s slot on the famous ’empty’ plinth in Trafalgar Square … hundreds of living art works, celebrating the importance of the individual and the ‘ordinary’ life, alongside the kings, generals and admirals more usually seen in public art in public squares. Very often in my talks I think I gain as much as I give! Thank you for a lovely warm reception in Tunbridge Wells and for sharing your Gormley stories. Lovely! I have fond memories of the Angel of the North. I just like the valuable information you provide on your articles. I will bookmark your weblog and take a look at once more right here regularly. I am relatively certain I’ll learn many new stuff proper here! Best of luck for the following!